UK Loft Boarding Ltd are the only LoftZone factory approved company in the North of England. This system, when installed will allow your loft to keep its insulation level high and for your home to remain energy efficient. Enables compliance with Part L, Part K, CDM and Working At Height industry regulations. This system has won many awards over the years including winning ideal inventor at the Ideal Home Show. 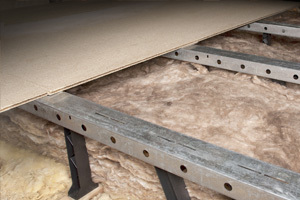 The LoftZone raised loft floor is lightweight, low cost, quick to have installed and provides a very strong platform for storing items and walking on, while protecting the 270mm loft insulation and allowing it to save energy and cut fuel bills as intended. In most cases, depending on how, it can be installed in just a day with minimal disruption to your home by our very own qualified and factory approved LoftZone installers. You're not alone - the vast majority of UK households use their lofts for storage. But the extra insulation required to cut fuel bills and save energy makes it very difficult to use the loft space for storage. Many people put boxes on top of the insulation or, even worse, put boards down on top of the joists. This is a major no-no as, in both cases, the insulation gets compressed. Squashed insulation doesn't perform very well! 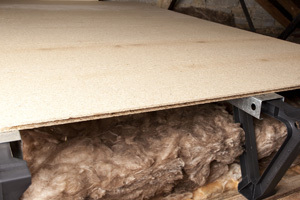 The mineral wool loft insulation works because of the air trapped inside the insulation and if you compress it, the air gets squeezed out, making it much less effective. LoftZone installer network covers 90% of England. Manchester Loft Boarding are the only Northern factory approved installer (a UK Loft Boarding Ltd Company). All you have to do is call our office on 0800 8799967 to arrange a FREE no obligation survey to determine your exact requirements and provide you with an immediate fixed price quote. If you are not in the North of England visit this website [NATIONAL APPROVED INSTALLER NETWORK] who has a list of all the LoftZone approved installers and areas.